Fortress Railing – Fortress Aluminum Railing & Accessories – Al13 | International Wood Products, LLC. 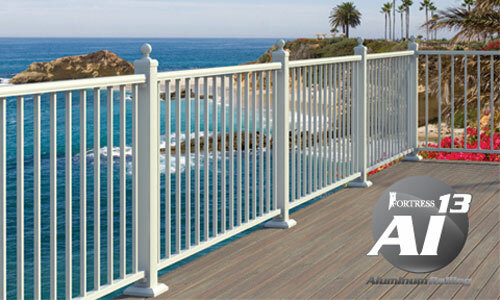 Fortress Al13 Aluminum Railing is an innovative, first of its kind, fully pre-welded aluminum railing system. Distinctly different from aluminum kits, Fortress™ Railing Products Al13 is attractive and easy to install with its simple bracket systems. It also has superior performance in strength and safety, which is a unique benefit to a pre-welded system. Quality welding and premium powder coating create a low maintenance system designed for use in a variety of environments. Why consider Fortress Aluminum?